My sister recently bought a house with her partner and I wanted to give them something as a housewarming gift. What do you buy two adults who have lived on their own for many years, they don't need a blender they already have two! I decided on a basket of items that were useful; toilet paper, energy saving light bulbs, a valentine's hand towel etc. But I can never give a gift without having some crafty element to it! 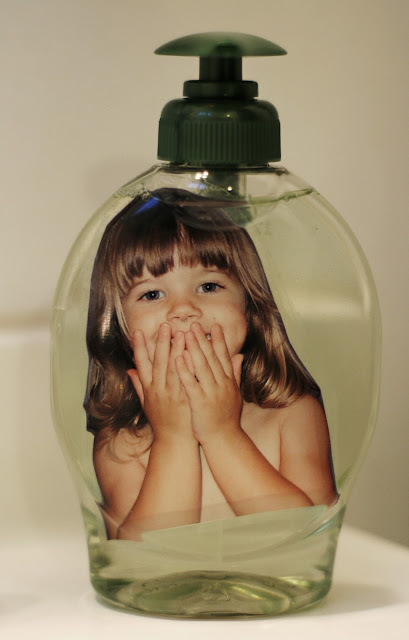 So I made a personalized soap bottle for my niece's bathroom. I removed the label using peanut butter, yes peanut butter! Since I was only going to make one bottle I didn't want to purchase goo gone. If I were doing more than one bottle I would recommend using goo gone but for only one- using a natural product that you already have in your pantry makes more sense to me. Why spend money when you don't have to? I printed out a picture of my niece on photo paper and then laminated it using my Xyron machine (which I just realized they don't make anymore AHHHH!!!!! What will I do for refills???). 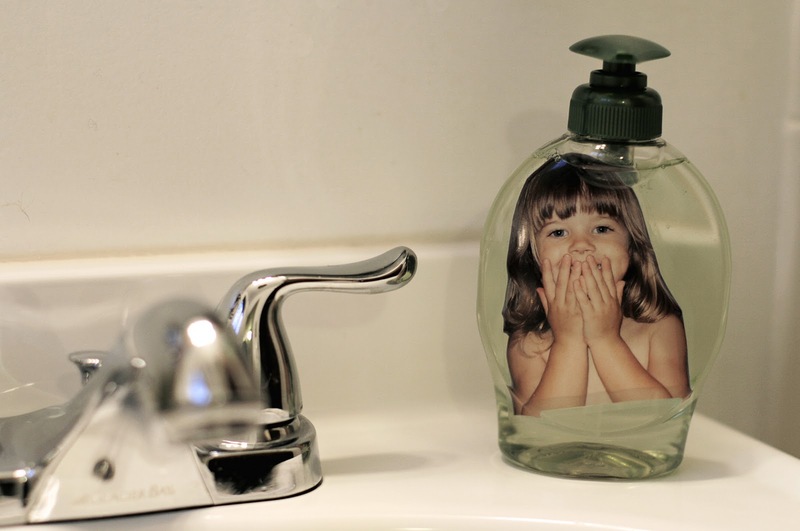 I cut around the picture and curled it into a tube and gently pushed it into the soap bottle. That's it. Such a simple and easy gift! Your kids could even help make them. I saw a similar idea on DesignMom for a teacher gift, she printed her message on a transparency sheet, I am sure you could get a picture easily printed on transparency as well. Or instead of a picture you could print the family's initial to make a monogramed gift. Regardless of whether you laminate the picture or print on transparenecy this gift costs under $5 and will be used over and over again. Great for stocking stuffers, teacher gifts, housewarming, mother's day or for your eighty year old grandmother who has everything she could ever want! Just found something similar to this on Pinterest, did a search for a tutorial, and yours came up... just posted on Craft Gossip! I've tried the photos with a transparency. They don't print properly, the white is transparent and looks really creepy! Since I have very fair skinned kids, parts of their faces were see through. So I just used words with this craft in the past. Thanks for the laminating tip. Thanks Elizabeth for letting me know about the transparency tip! I've also used clear packing tape over a picture and it worked as well. I used a smaller picture so that the tape surround the whole image. Thanks LessonPlans for reposting on your blog! Great web site. Lots of useful info here. I am sending it to several buddies ans also sharing in delicious.